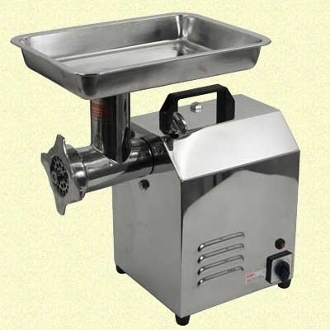 The #12 Electric Meat Grinder is outfitted with Stainless Steel construction (including the tray). A mirror-finished polish on the housing gives it a sharp and professional look. This grinder not only looks great, but it is equally powerful and efficient. A 1(one) Horsepower motor in this grinder makes easy work of even the toughest jobs. Built to strict hygienic and mechanical standards; you will appreciate and enjoy this #12 electric meat grinder for many, many years. Also included are a Chopping Knife, a 3/4" Dia. Stuffing Tube, a 5/16" (8mm) Grinding Plate and a 1/4" (6mm) Stainless Steel Grinding Plate with Hub (for easy removal and installation). • Electrical: 110V/60Hz, 735Watt, 1-Phase.